The primary reason to refinance is generally to initiate a mortgage with a lower interest rate or to get rid of private mortgage insurance. Doing so can help make monthly payments smaller. Refinancing also gives the opportunity to consolidate multiple loans, reduce your repayment period, and even cash out and use the equity that has built up over the life of your loan. In an ideal world, refinancing would guarantee that you save money. However, that is not always the case. For example, a lower interest rate can reduce payments, but if you have to extend the repayment period to do so, will you still be saving money long term? Maybe, maybe not. Refinancing can result in a longer repayment period and/or a higher interest rate, so it is important to make sure your finances are in great shape before applying. In addition, you will need to check your current mortgage to see if there are any financial penalties for paying off the loan early. Some loans may require that you pay some or all of the interest that would be incurred if the loan went the full repayment period. You will also need to go through the full approval process again, including application fees, closing costs, and any other associated fees — so you will want to be sure the difference in savings is larger than the fees. There is no single blanket answer for whether or not it is the right time to refinance. As you can see from the range of different variables, determining whether you ought to refinance will depend on a lot of individualized financial factors. When you begin talking to lenders about refinancing, you will need to proceed with caution, just as you did when applying for your initial mortgage. Refinancing is generally of financial benefit to the lender, so it will be up to you to double check and ensure it is beneficial to you as well. Yes, that may require a lot of math, but it is worth the hassle to make sure you are making a savvy financial decision. When it comes down to it, lenders will be putting their own best interest at the fore. Because of this, we suggest finding professional assistance to keep your own best interests at heart. A real estate lawyer can look over both your existing mortgage contract and any refinance paperwork to help you determine what is going to benefit you most. 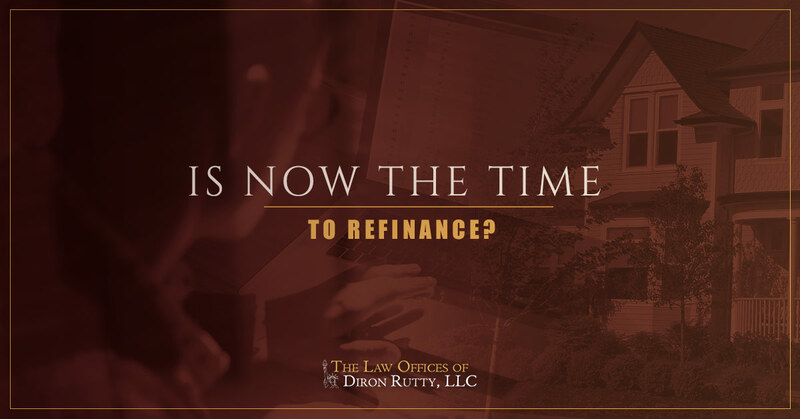 Contact the Law Office of Diron Rutty, LLC for more information and to schedule your consultation in the Bronx.